Getting the best advice is tricky. You cannot get ‘best advice’ from anyone. Have you ever noticed that the people who give the best advice typically don’t talk too much about themselves? It makes you wonder a little. Where did such knowledge to give advice come from? 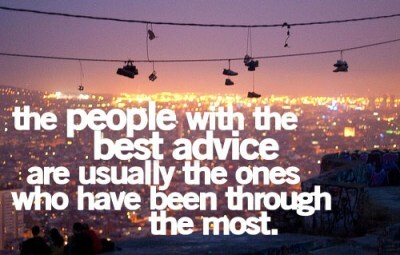 The people who give the best advice have been through the most. They may not talk about it any other way than in the advice that they give. Their silence with regard to themselves speaks volumes. And by stuff I mean knowledge, wisdom <in some form or fashion>, experiences and … well … a nice ability to take all that stuff inside them and look at you … and understand … and articulate it. They not only have the ability to see within the circumstances but their own experiences to match up. That means they have such a broad experience base they can relate to a broad group of circumstances. THAT means they have been through more than you. Because I am not sure we do … because, frankly, we are too busy getting the well needed advice. And we think about it even less because I believe people who give great advice tend to be broader in their thinking and have an innate sense of curiosity which is a deceptively positive cloak for their own experiences. A cloak that looks an awful like … I don’t know … wisdom? The wisdom needs to come from somewhere. At some point … they may not need advice … but they may need someone to listen. All I know for sure is that the people who give the best advice tend to have been the ones who have experienced the most.